Thursday evening (September 6th), which coincidentally was Roger Waters' 75th birthday, those present at the Lucius gig at the atmospheric Union Chapel, in Islington, London, were party to a real surprise. During their set, Roger himself appeared to perform a couple of acoustic numbers with the band, the first song being Mother and the second, Goodnight Irene. 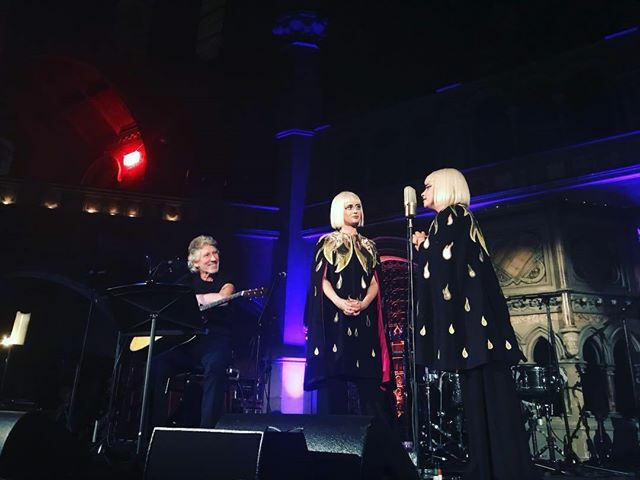 BD contributor Rob Whitmarsh said about "this most magical night [that] I never imagined I'd be seeing Roger Waters performing a couple of songs in a church. The lighting was incredibly low (candle light and a couple of low level lights behind them), so my photos reflect this. I tried using a flash a couple of times, but it just reflected the air due to the atmosphere (probably candle smoke rather than dry ice). Our thanks to Marcelo Paulo De Souza for the picture shown here (click the thumbnail) and for additional information about the show. Rob's pictures will be here shortly!